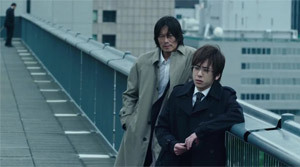 Story: Detective Reiji Asama (Etsushi Toyokawa) is going after a serial killer, but he is still without a clue. 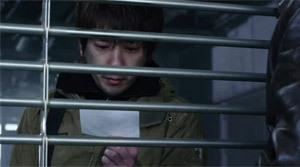 That's when young scientist Ryuhei Kagura (Kazunari Ninomiya) presents the culprit's DNA profile. Not only can he determine the looks of the killer thanks to a hair found at a crime scene, he can also find a relative of him by running the information through a database, thus also finding out the exact name of the killer. Traditional police work doesn't seem to be necessary in the future anymore. Even though Kagura may have stretched the boundaries of legality there will soon be an entire DNA database of all Japanese people created officially, which is supposed to be used for crime investigation. 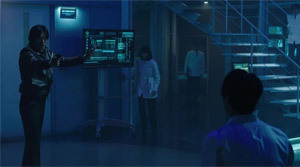 But suddenly Kagura's partner Saki (Kiko Mizuhara) is killed and the DNA analysis points at Kagura as the killer. 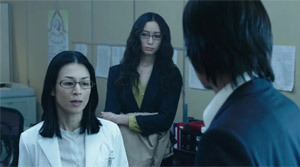 Now, Kagura is on the run and only gets support by his colleague Risa (Anne Watanabe) who is looking for Saki's notes of her last work project which is why she probably got killed. Detective Reiji is quite aware that someone wants to pin the murder on Kagura and just like the scientist he wants to uncover the obvious conspiracy, too. Review: What happens if you want to place too many elements into a movie at the same time, because the source material, a novel by Keigo Higashino, offers numerous aspects which would just be a pity to scratch from the screenplay? Right, you get an action/sci-fi flick that lacks a good foundation and focus. "Platinum Data" is an amibitious blockbuster which wants to create epic scale with its bombastic score and a few action sequences that seem forced into the film, but considering the simple crime story around a murder as well as the mandatory conspiracy this seems to be out of place. And when the director actually shifts down a gear or two and sheds light on the more contemplative aspects this comes across in an almost sermonizing manner. In its core the movie may entertain decently, but there are too many problems during the ride. Keigo Higashinos novels have already been adapted for the screen numerous times and not only in Japan. 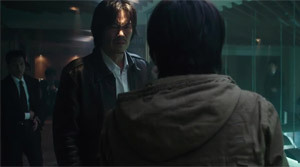 "The Hovering Blade" has also been brought to screen by Korean filmmakers as "Broken" as is the case with "Perfect Number" (aka "Suspect X"). The problem with those criminal stories with a strong tendency to question our moral concept is naturally that a movie oftentimes can't do justice to the complexity of a novel. In respect to Keigo Higashino's novels this has never been illustrated as clearly as in "Platinum Data", even though I have to admit that I didn't read the original. However, the big issue is that we are sold a crime story as a sci-fi blockbuster. And yet the movie can't escape its identity as a detective story, at which end the answer to the question of who's the murderer is ultimately revealed. Keishi Ohtomo has already been able to convince with his adaptation of the manga "Rurouni Kenshin" and even more with the two sequels. So there should be no doubt that he knows how to compose action. But here he misses the mark one time too often. Especially the chasing scenes lack any soul. The search for Kagura in the beginning may be the most thrilling one, when a lot of CCTV cameras are utilized in order to find the man on the run. It's also here that it becomes apparent that the filmmakers didn't shy away from any expenses. The many high tech sets are in fact impressive, even though at some points you have to ask what kind of purpose several feet high screens actually serve scientists. As already stated the action may not be the movie's forte, but at least we could hope for some drama in a Japanese movie which manages to give the characters more depth, right? Yet, the drama only comes to the foreground towards the end. There are constantly a few flashbacks thrown in, which are also a bit unnecessary, but only after almost all of our questions are answered, the drama kicks in. This also works in a way, but it's too late to breathe some life into the individuals. And they really are in strong need of that. Etsushi Toyokawa, also to be seen in the thriller based on another Keigo Higashino novel "The Lakeside Murder Case", is a clich� of a stoic and always serious detective with a good heart. 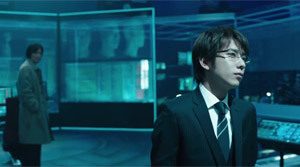 Kazunari Ninomiya ("Gantz") plays two roles at the same time and delivers a decent performance, but the source material barely offers material that is easy to convey. Yes, the story is in fact laying it on too thick at times and even the author seems to have bit off more than he could chew with all the implemented elements. This becomes the most apparent towards the end. You can already make out that a novel served as source material because of the numerous epilogues. The movie doesn't know when to finally let the credits roll. Moreover, it also delivers spoonfed ideas about ethics and philosophy concerning what really makes humans the way they are. That's hardly convincing. Next to that we already know many of the sci-fi elements from countless similar movies/books and the twist seriously isn't surprising. To make matters worse everything looks as if being put together haphazardly and is underlined by a score which is too obtrusive and wants to make us believe that "Platinum Data" is an adrenaline-loaden action flick. It's not. But similar to shallow razzle-dazzle blockbusters the individuals lack depth, too. Director Keishi Ohtomo apparently doesn't know where he wants to put his focus and this makes this picture not only way too long with a running time of 135 minutes, but also forces it to slowly fall apart.